At our training company we deal with all kinds of dogs. We get owners with young puppies looking for some basic obedience and manners all the way to dogs with serious aggression who have a record of biting multiple people. Here at Joey Luke’s Dog Training we’ve seen it all. Recently we had a dog come in with some extreme fear and nervousness issues. Gracie was adopted from a local animal shelter a few weeks prior to coming to stay with us for our board and train program. 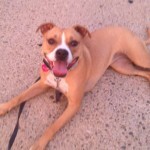 Her owners fell in love with her when they were visiting the shelter but knew that they needed help with her reactivity. Gracie was reacting at strangers (mostly men) as well as some dogs that she met. In this case study you’ll see how Gracie was when she first came to us, the training and work we put in with her and the transformation she went through during her short time with us. Check out the below video of Gracie’s transformation during her stay with us. If you are a Metro Detroit dog owner who has a dog that is struggling with fear and anxiety, don’t wait! Click the link below to set up an evaluation today.